Before I share another outing with you, I have some news. On May 30 we (finally) received an offer on our house which we accepted. If all goes well (and we certainly hope it does!) the closing will be on 6/27 and that's also when we transfer possession. We've been waiting for 8+ months and now things seem to be happening pretty fast. We accepted the offer while in Oregon so had a jumpstart on going to the Redmond area to try to finalize on a house there. More on that later. I'll just say that it looks like we will be building a new home and that's pretty exciting. This card is layers of gray with a black panel and once again I'm making use of the inside of a security envelope. 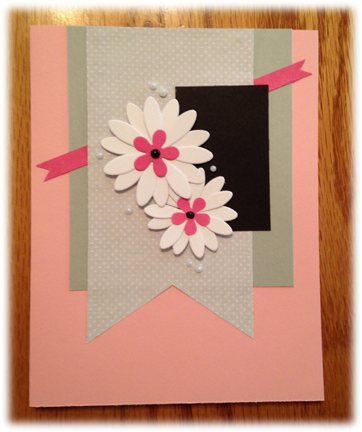 The flowers were created with the new Obsession Impression die that I'm quite fond of but centers are punched. I added a narrow strip of the dark pink to pull things together but maybe that's not what it's doing. You be the judge of that. That is great news. So glad it is finally coming to an end and you can't beat a brand new home built to your specifications. I know you'll be super busy packing and moving so I'll follow you on FB.